The state of New York is home to not only bustling cities and beautiful landscapes, but also some of the world’s most magnificent castles. 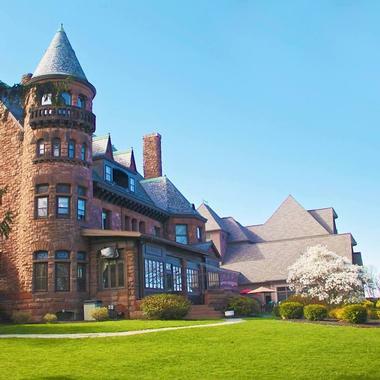 From the Hudson Valley and the Thousand Islands region to Buffalo, Bolton Landing, and Huntington, impressive, elegant, and mysterious edifices, Victorian manor houses, and rolling estates abound. Here are some of the Empire State’s most beautiful castles. 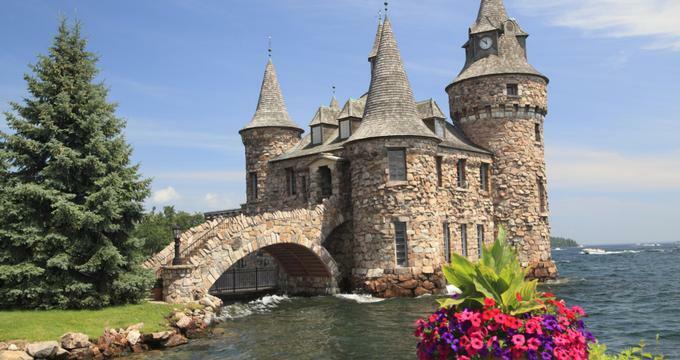 The historic Boldt Castle is the crown jewel of Alexandria Bay. Situated on Heart Island in the center of the St. Lawrence River's Thousand Islands region, the magnificent castle was built in 1900 by millionaire George Boldt as a tribute to his love for his wife; however, she sadly died a few months before its completion. The property remained vacant for more than 70 years before being acquired by the Thousand Islands Bridge Authority, who restored it to its former glory and opened it to the public as a significant landmark and tourist attraction. The castle is open seasonally between mid-May and mid-October, and visitors can stroll around the glorious gardens and grounds of Heart Island and explore the many rooms of the edifice on self-guided or docent-led tours. Situated on Dark Island in the Thousand Islands region, Singer Castle is a magnificent 100-year-old castle with intricate architecture, beautiful furnishings, and mysterious secret passages. 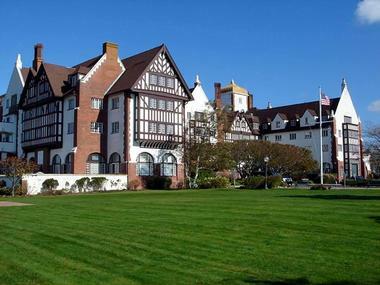 Originally named “The Towers,” Singer Castle was built and owned by the Bourne family from 1905 to the mid-1960s and features 28 rooms, a four-story tower, and an elaborate boathouse that once housed a workshop and powerhouse. The castle also boasts many intriguing underground passageways, tunnels and dungeons, and other curious architectural details like a two-story ice house. Visitors can explore the castle on guided tours or spend a night like royalty by reserving an entire wing of the house, which includes luxury suites, a catered dinner, and private docent-led tours. Castle Gould is a small castle-like building on the grounds of the Gould-Guggenheim Estate or Sands Point Preserve in Sands Point, New York. Begun by Howard Gould and completed by Daniel Guggenheim, the estate grounds feature two castle-like buildings, the main house known as Hempstead House and the smaller Castle Gould. 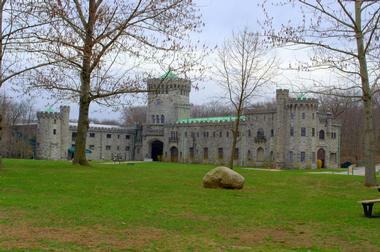 Designed by architect Augustus N. Allen in 1902, Castle Gould was modeled after Ireland’s Kilkenny Castle and is an impressive 100,000-square-foot limestone building, which served as the stables and carriage house and later as the servants’ quarters. 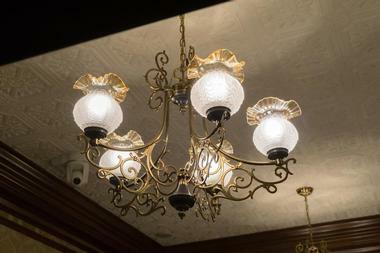 While the castle does not not offer tours, you can stop at the visitor center, and participate in seasonal events in the Great Hall, a unique event space with high vaulted ceilings, intricate wrought-iron chandeliers, and plush draperies, and a state-of-the-art soundstage. Poised on a graceful mountaintop overlooking majestic Lake George in Bolton Landing, upstate New York, Highlands Castle is a luxurious hotel with boasts breathtaking views of Lake George and the Adirondack Mountains. The luxury estate and manor house can be hired for special events and occasions, including weddings and other celebrations, deluxe vacation stays, honeymoon rentals, and family vacation stays. The castle can accommodate up to 18 guests and features beautifully appointed guest rooms and bathrooms, elegant dining rooms and lounges, fully equipped kitchens, and large terraces with spectacular views. 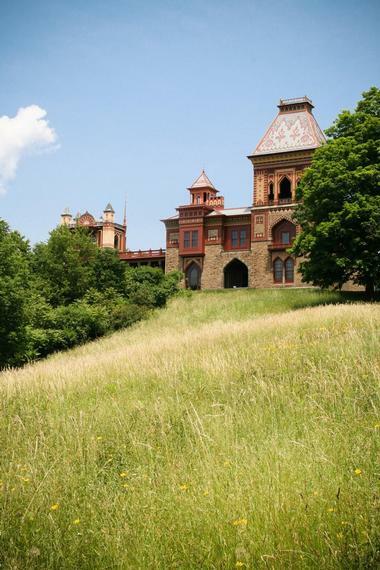 The Olana Historic Site is a historical house museum property and National Historic Landmark in Greenport that preserves the home of Hudson River School artist Frederic Church, one of the significant figures in the Hudson River School of landscape painting. Named for a home in Persia that inspired Church, the Olana Historic Site once served as the home and studio of the painter and today celebrates the artist’s views that inspired his paintings, which are featured throughout the site. One of the few artist home, studio, and estate complexes in the United States, the Olana Historic Site is among the most visited sites in the state. 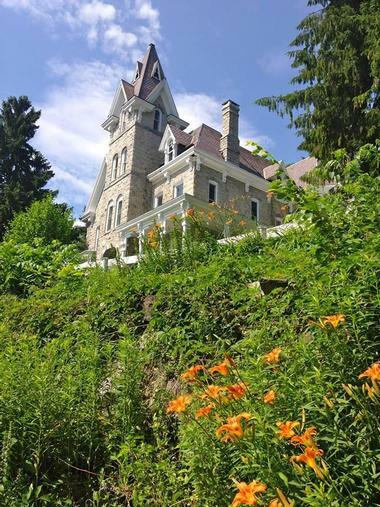 Once the estate of former Illinois Central Railroad president William H. Osborn, Castle Rock is a magnificent castle in Garrison that rests on a hill high above the Hudson River and boasts breathtaking views of the surrounding countryside. One of the most recognizable man-made landmarks of the Hudson Highlands, the castle was initially built as a summer residence by J. Morgan Slade in 1881 and has since been listed on the National Register of Historic Places. The castle and surrounding buildings are private and closed to the public, however, the surrounding land is open and a favorite spot for hiking and mountain biking. 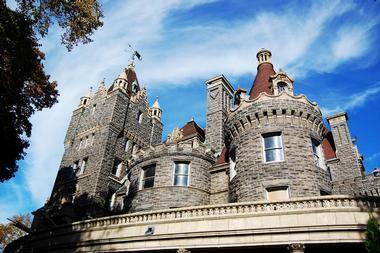 Built in 1860, Beardslee Castle is a beautifully designed castle modeled after the grand castles in Ireland. Located in Little Falls, south of the Adirondacks, the three-story ivy-covered manor house has been rebuilt twice, after having been burned down in 1919 and 1989, and is now used primarily as a restaurant and wedding venue. Beardslee Castle was built by Augustus Beardslee, son of widowed Lavina Beardslee, who began the project in the late 1790s, and it was completed 70 years later. The castle is thought to be haunted by many spirits and offers murder mystery series and other such events at the restaurant. Belvedere Castle is a folly (a building constructed primarily for decoration) in Central Park in Manhattan and features exhibit rooms and an observation deck. 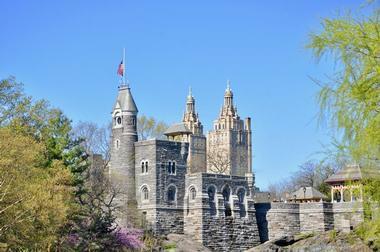 Designed by Frederick Law Olmstead (the designer of Central Park) and Calvert Vaux in the late 19th century, the castle is an architectural hybrid of Gothic and Romanesque styles and boasts a corner tower with a conical cap and a lookout over parapet walls with beautiful views of the park. Meaning “beautiful or panoramic views” in Italian, Belvedere Castle has also been the location of the official Central Park weather station since 1919. Resting on the shores of Seneca Lake in Geneva, Belhurst Castle is a beautifully restored manor house and estate that was once a private residence and is now open to the public as a luxury hotel, restaurant, and spa. 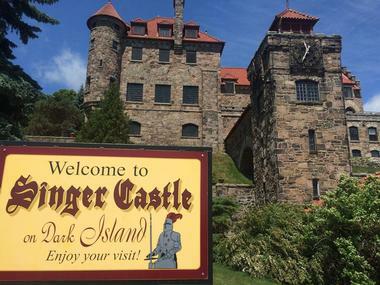 Built in the 1800s, the castle was once used as a speakeasy during the Prohibition era, and today is home to the Finger Lakes Winery, which has a tasting room and offers specialty wine-pairing dinners. Belhurst Castle also boasts two magnificent ballrooms, making it a popular venue for weddings and other special celebrations. 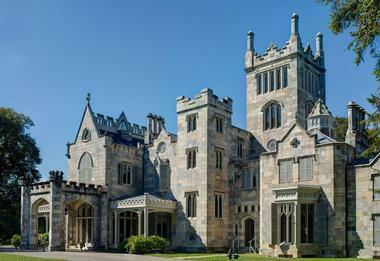 Lyndhurst Mansion, also known as the Jay Gould Estate, is a magnificent Gothic revival country house surrounded by a 67-acre park beside the Hudson River in Tarrytown, New York. Designed by Alexander Jackson Davis in 1838, the mansion features unusual architectural elements such as an asymmetrical outline, fanciful turrets, and an imposing four-story tower in the north wing. 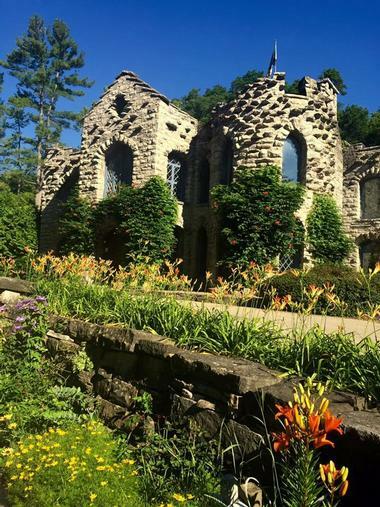 Constructed from limestone quarried at Sing Sing, the house was owned by a number of people, including railroad tycoon Jay Gould, whose daughter donated it to the National Trust for Historic Preservation in 1961. 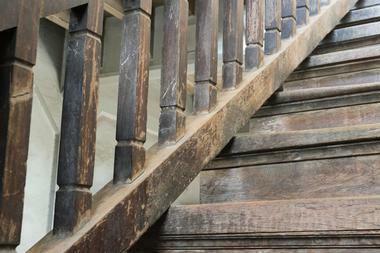 Today, Lyndhurst Mansion is listed as a National Historic Landmark and is open for the public to explore. Tucked away in the West Hills section of Huntington, New York, and surrounded by magnificently manicured formal gardens, Oheka Castle is a beautiful chateau-style estate on the North Shore of Long Island’s Gold Coast. Also known as the Otto Kahn Estate, Oheka Castle was built between 1914 and 1919 as a luxurious country home by investment financier Otto Hermann Kahn, and today is a historic hotel with deluxe amenities. The hotel features elegant, stylishly decorated rooms with period antiques, original artworks, fireplaces and chandeliers, and upscale facilities such as an award-winning restaurant and bar, a fully equipped fitness center, and exquisite gardens. The estate and gardens can be explored on docent-led guided tours. 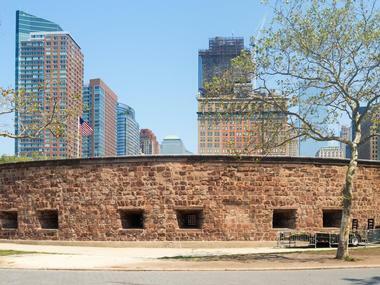 Castle Clinton or Fort Clinton is a circular sandstone fort located in Battery Park that was used as America’s first immigration station between 1855 and 1890. Previously known as Castle Garden, the fort (also known as West Battery or Southwest Battery), was designed by architects John McComb Jr. and Jonathan Williams and was completed in 1811 on a small artificial island offshore. Subsequent landfilling has expanded Battery Park, incorporating the fort into the mainland of Manhattan Island. Listed on the National Register of Historic Places, the Castle Clinton National Monument has also functioned as an exhibition hall, a theater, a public aquarium, a beer garden, and currently as a national monument. Greystone Castle is an elegant edifice in the small village of Canastota in Central New York that is used as a beautiful venue for weddings and other special celebrations. The castle was once a Methodist Episcopal church until the original wooden-structure was burnt to the ground in 1908 and a new building was constructed. After falling into disrepair, the castle was restored to its former glory, and today, the three-level abode offers spectacular ballrooms with stained-glass windows and intricate architectural detailing, boasting beautiful spaces for wedding ceremonies, receptions, and special events. Located just 75 miles north of New York City in the Millbrook area, Wing's Castle is an elegantly restored castle that has been turned into a bed and breakfast hotel. 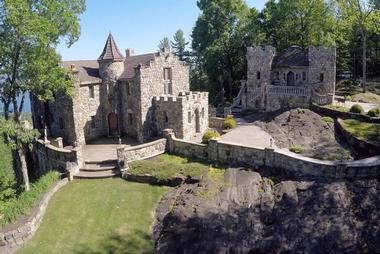 Close to the Taconic State Parkway, the Hudson River stone castle was built by artists Peter and Toni Ann Wing using salvaged materials from old buildings and features seven towers and a moat, which is still under construction. Wing's Castle offers unique accommodations for overnight stays, guided tours, and a variety of events such as summer camps throughout the year. Skene Manor is a historic home located at Whitehall in Washington County, New York. Built in 1874 in a beautiful Victorian-Gothic style, the manor house is constructed of grey sandstone and features a mansard roof, two towers, and three flat-roofed bracketed porches. The property on which Skene Manor stands was purchased by New York State Supreme Court Judge Joseph H. Potter in 1867 and was listed on the National Register of Historic Places as the Judge Joseph Potter House. Once a restaurant, the manor house is now being restored by Whitehall Skene Manor Restoration Inc., and will be open for the public to explore on guided tours. 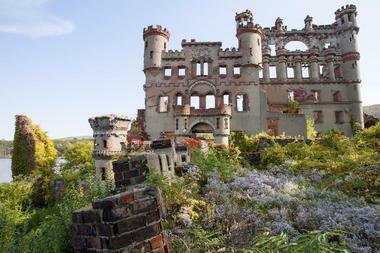 Bannerman’s Castle is located on 6.5-acre Pollepel Island in the Hudson River and, although now in ruins, was once a military surplus warehouse. The castle was built as an arsenal in the early 1900s by Francis Bannerman VI, who bought Pollepel Island to use as a storage facility for his growing surplus business. Portions of the abandoned castle’s exterior walls still stand, and one side of the castle, which carries the words “Bannerman’s Island Arsenal,” is visible to riders on the Amtrak Empire Service and Metro-North Railroad Hudson Line; however, all the internal floors and non-structural walls have since burned down. The Frederick Ferris Thompson Memorial Library is the primary library building at Vassar College, in Arlington. 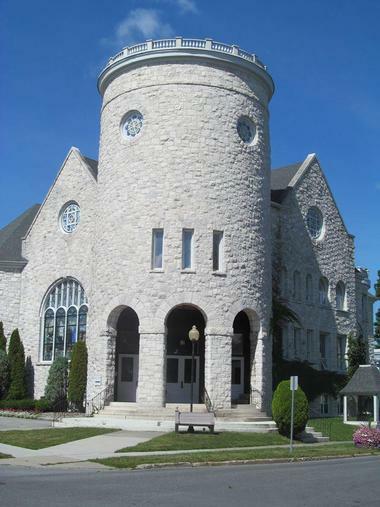 Designed by Francis R. Allen in the Perpendicular Gothic style and constructed from Germantown stone with limestone trimming from Indiana, the building features three wings built around a central tower supported by buttress walls and crowned with battlements and pinnacles. A magnificent stone frieze of college and university seals flanks the entrance to the building below the ceiling windows in the central hall and below the gargoyles on the bottom corners of the tower. 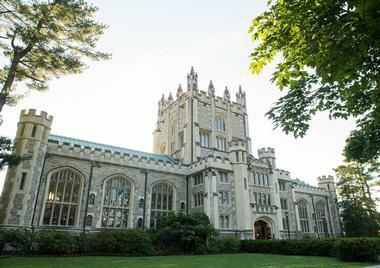 The Frederick Ferris Thompson Memorial Library encompasses seven libraries at Vassar and comprises around million volumes and 7,500 serial, newspaper, and periodical titles, and an extensive collection of microfilm and microfiche. 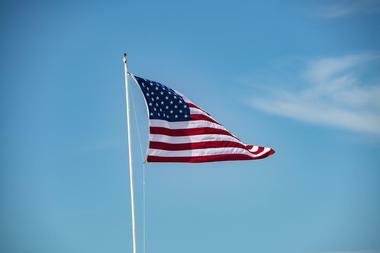 The Connecticut Street Armory, also known as the 74th Regimental Armory, is a historical armory building in Buffalo, Erie County, that is currently home to and used by the National Guard. Situated in Columbus Park, the massive castle-like structure was designed in 1899 by architect Isaac G. Perry and constructed out of Medina sandstone. 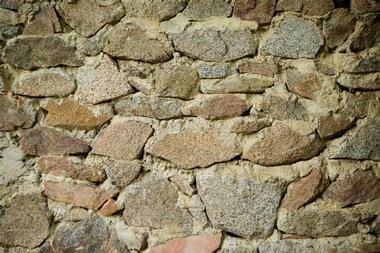 The building features a rusticated battered stone foundation, four six-story towers surrounding an administration building, and six squat, square towers at the center entrance. Today, the building houses the 74th Regiment of the New York National Guard and is listed on the National Register of Historic Places. Tonawanda Castle is an old castle that was initially constructed as an armory for the 25th Separate Company of the National Guard. Today, it is used as a beautiful venue for special events such as wedding ceremonies and receptions. The imposing yet artful 38,000-square-foot armory was designed in the Richardsonian Romanesque architectural style by Isaac Perry in 1896 and was built with Warsaw blue granite foundations and thick walls of mason brick. 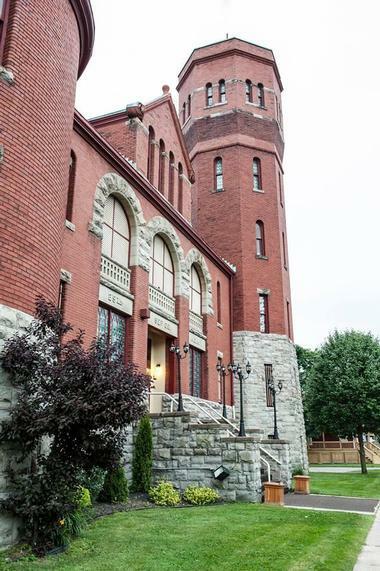 The historic building has presided over Delaware Street in the city of Tonawanda for more than 100 years, and today offers a magnificent venue for special functions from weddings to corporate events with spacious banquet and reception rooms and modern amenities. Situated on the shores of Mohonk Lake in the Shawangunk Mountains, the Mohonk Mountain House is a beautiful Victorian castle that boasts an award-winning luxury hotel and spa. Built in 1869 just outside of New Paltz, the Mohonk Mountain House is considered to be one of the world’s best hotels with a magnificent 30,000-square-foot spa and a black-tie restaurant, which serves three-course dinners with wine pairings from the acclaimed wine cellar. The deluxe resort also features a championship 18-hole golf course, ice-skating, cross-country, and snowshoeing, along with an array of other first-class amenities and facilities.